FONTBLANCHE est une grande propriété de campagne de 10 acres qui a amplement d'espace pour un maximum de 22 personnes et est disponible à la semaine ou plus. Il est entouré de vignes, de vergers d'oliviers, cerisiers, et des vues spectaculaires de la vallée du Luberon et ses villages perchés. Il est situé au pied du magnifique village de Gordes, à distance de marche de son activité, mais reposant dans son propre espace paisible. Parce qu'il se niche sur un léger plateau, il donne sur les plaines agricoles vastes et belles de la vallée. FONTBLANCHE est un endroit où vous pouvez lire le jour loin dans une chaise confortable, le salon ou sur l'une des nombreuses terrasses ensoleillées avec un plongeon dans la piscine occasionnelle. Ou vous pouvez laisser la propriété de chercher ce qui fait que les gens aiment la Provence. Ceci est une zone idéale pour les aventures vélo et de randonnée. Le vélo et la randonnée peuvent commencer à droite à la maison, ou avec un court trajet en voiture vous pouvez trouver de nombreuses excellentes possibilités de randonnée. Le gardien de maison habite dans un appartement séparé avec une entrée séparée. Elle sera là si vous avez des questions ou si vous avez besoin d'aide. 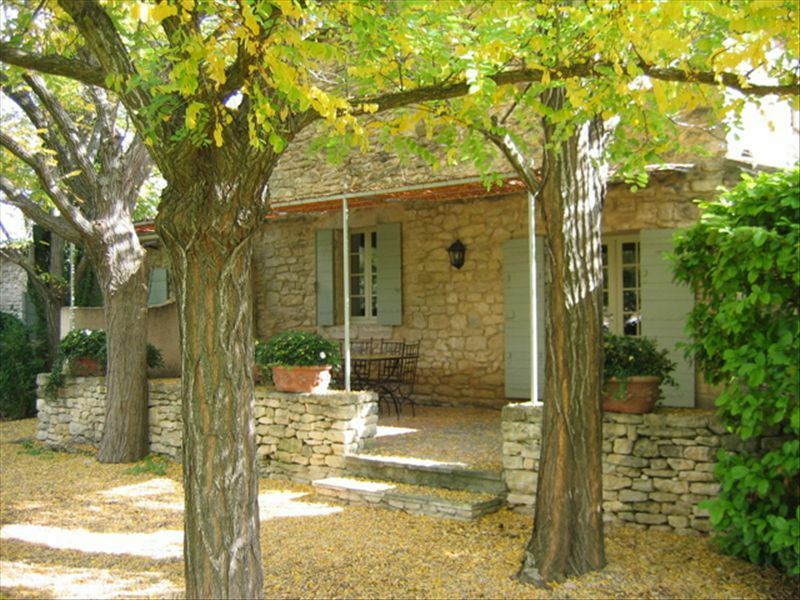 Fontblanche is a stones throw from Gordes and set in stunning surroundings in the Luberon valley with fantastic views in a number of directions. The house itself is an absolute gem with the photos not nearly doing it the justice it deserves. In short, if you are thinking about it...do it! Beautiful heritage property with all the comforts. Our group of six couples enjoyed a wonderful week at Fontblanche. We were delighted with the selection of well furnished rooms and amenities. We thoroughly enjoyed preparing meals together in the well equipped kitchen; gathering on the several patios; dining in the spacious dining room; lounging in the comfortable sitting rooms throughout the house; as well as exploring the beautiful countryside, Gordes and surrounding areas. A romantic and ideal family retreat! My husband and I got married at the home in June. Both of our families had a very relaxing, intimate, exciting week. It was an easy drive from the airport, about an hour. We werent given an address, so we got there by GPS coordinates. The property and home were both more than we had hoped for. The grooms family stayed in the bergerie, which was very accommodating and only a short walk from the main house. The bathrooms were tiny with a low ceiling, and it was a little dirty when we arrived, but it was fine. The lavender field in front was in full bloom! The main house was really fun to get to know, because of its unique floor plan. It was really fun to get lost in and wonder about. Everyone had lots of privacy within the home. We felt like we had gone back in time. The decor suited the architecture, but also felt modern and comfortable. We loved having big dinners in the dining room or under the pergola at the pool. The view from the kitchen was great and we spent a lot of time in there cooking. We also enjoyed cooking on the grill by the pool. We were there in June, and with no AC, it got pretty hot in some rooms, particularly the kitchen. We had a hard time keeping flies out of the kitchen, because we had the doors and windows open for most of the day, but it wasn't a big issue. It was a struggle to cool off at night in certain bedrooms. We really enjoyed the lighted tennis court! We were only a short, 10 min drive from Gordes (which u can see from the house) and short drives away from the other Luberon villages. The house managers were kind enough to have some groceries, champagne, and flowers waiting for us and everyone's name was pinned to their bedroom, to avoid any confusion. The only issues we had were the pool needed cleaning (which they came back and did), the porches were a bit dirty and messy, there was a broken toilet in the pool house, all of the exterior furniture cushions were stored inside, a lot of the pots had dead plants, and generally it needed a little landscaping work.. just a bit unkempt in certain areas. The house managers were a little difficult to communicate with, maybe because of a language barrier, but they weren't very responsive to emails. The owner, Davis, was helpful when I could not reach them. All in an unforgettable trip, and I would be ecstatic if I ever got to stay there again! 1 weeks was not long enough. There were 16 of us all ages arriving from Wisconsin and Minnesota..none of us knew what to expect only hoped that our stay could be half as good as other reviews! We played tennis--even at night,rode bikes through the country side of lavender, poppies and rolled bales of hay. Ate on patios, cooked fabulous meals,went to markets, sang, laughed, enjoyed all kinds of beverages, and played Marco Polo in the refreshing pool. Our welcome by Herve was delightful and he was always available to assist in some minor problems. Salle, les marchés, le cyclisme, l'art, la musique, des festivals, de la randonnée, de l'escalade, des antiquités, de détente, piscine, tennis, kayak, la cuisine, shopping, spa, truffes, vin, fromage, lavande, vigne, piscine.